One of my favorite family traditions involves hanging around with my dad’s parents and his siblings where they all make fun of each other for the stupid, goofy, awkward things they did when they were kids. They were a wild and crazy brood prone to frequent collar bone breaks. One of the strangest parts, of course, is that most of the stories are being told by the person who looked the most ridiculous in that story. They have learned to laugh at their embarrassing moments. A fascinating thing about the internet is the ability for random people to connect with other random people to the point where they feel like friends even though they have never even seen each other. Don’t believe me? How many of you would know who I am without the internet? I probably have more people that I consider friends that I have never seen than actual friends these days. So now we have all these great cyber friends that we share our deepest, darkest fears, secrets, crude jokes, and doubts. And parenting stories. And we all have these amazing cameras that fit in our pocket allowing us to shoot video of anything happening in our lives and upload it to our blogs and YouTube for our real and cyber friends to enjoy. All of which reminds me of America’s Funniest Home Videos. What always gets the laughs? Some guy getting his nuts smashed. Some old lady falling while dancing at a wedding. Some cat with his head stuck in a jar. High brow stuff like that. YouTube has inherited a lot of those great traditions and added a new one, apparently. Parents film their kids on the naughty chair (or whatever the disciplinary penalty box is called in your house). The kid is screaming, crying, promising to never be naughty again, promising to always be naughty again. The real train wreck stuff. And some of these kids being disciplined are really much closer to being babies which brings up the appropriateness of even disciplining these kids much less spreading it around the internet. The lack of respect it takes to film a child’s most embarrassing moments as entertainment and the misuse of time-outs that are now serving as punishment rather than guidance, basically makes this type of treatment abuse. No, it is not reportable by standard definitions, but again if you humiliated an adult and video taped your punishing him, it would be considered abusive. Outside of the immediacy of the act of videotaping these vulnerable moments and the breach of trust that can cause, though, there are more long lasting repercussions when we start to post those videos on the internet. Yes bitching and moaning to our friends about pulling the cat’s tail again while we down a couple beers can be an important stress valve but what happens when our friends increasingly become more cyber and the way we tell them is indexable by Google and searchable by their classmates, teachers, future girlfriends/boyfriends, future employers. So where should we draw the line. I tend to try to follow 2 rules. Anonymize. Nobody needs to know the real names of our families. We are all semi-fake to each other anyway. Fake names are perfectly fine. Just think of them as nicknames. Don’t beat down our kids. Normally when I talk about behavioral issues I try to provide some kind of insight into what I think was happening and what I am going to try to help the kids through those issues so that other parents can either get some new ideas or share some of theirs with me. If I don’t have an important life lesson, I try to just use it to show that sometimes being naughty is really more about kids experimenting and sometimes you just have to learn to enjoy that, too. 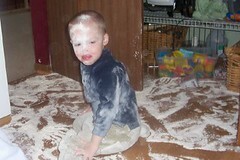 For example the picture above is from this post where Pookie made a mess and we realized that he was just being a kid. Now someday our little kids will be grownups with kids of their own and we can all sit around the Christmas tree telling embarrassing stories about them when they are old enough to handle it. Until then, let’s try to keep things classy. What rules do you use to determine what you will and won’t write about or post videos of your kids online?